Sheer ribbon is "see through" and usually made from organza fabric. We have wired sheer ribbon, and unwired sheer ribbon. 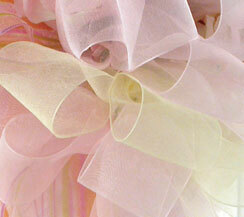 Sheer ribbon is best used for gift wrap, some bridal wear, paper crafts, and floral design.